Local legislators in East Multnomah County vow more support for community colleges. The legislators representing East Multnomah County agree that Oregon's community colleges need more support. A group of elected officials made a declaration to help institutions like Mt. 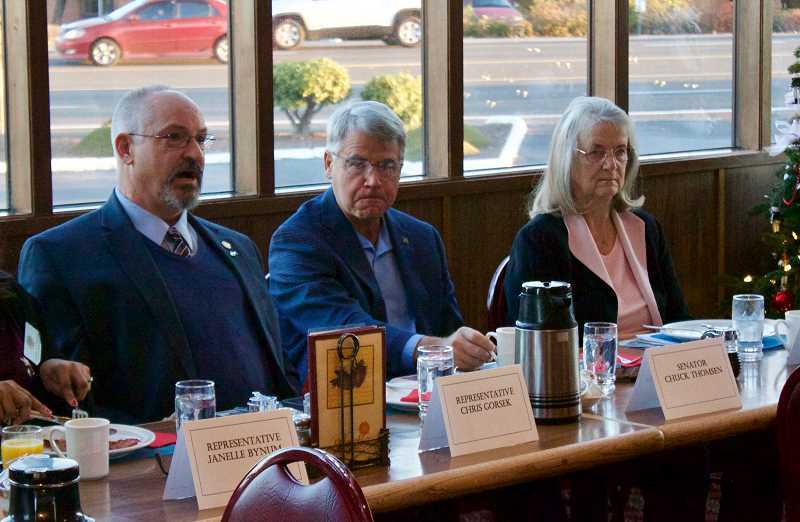 Hood Community College (MHCC) and spoke about their goals for the upcoming 2019 Oregon Legislative Session during a breakfast hosted by East Metro Economic Alliance Thursday morning, Dec. 6, at Heidi's of Gresham, 1230 N.E. Cleveland Ave. In attendance were Rep. Chris Gorsek, D-District 49; Rep. Janelle Bynum, D-District 51; Sen. Laurie Monnes-Anderson, D-District 25; Sen. Chuck Thomsen, R-District 26; and Sen. Lew Frederick, D-District 22. "I want to hear from all of you, and foster a good solid environment for the economy of East County," Gorsek told the gathered group of business owners and community leaders. Despite crossing party lines, and representing different areas of the region, all agreed that Oregon Gov. Kate Brown's proposed $23.6 billion budget wasn't the answer. "The Governor's budget is not satisfactory — it's flat," Gorsek said. "It's not adequate, but hopefully we can use it as a conversation starter." The governor's budget proposal would result in a 4.7 percent funding cut, reducing Oregon's Community College Support Fund from $570 million during the 2017-19 biennium to $543 million for the 2019-21 biennium. "I was aghast at what the governor's budget did to community colleges," Thomsen said. To bridge the kind of gap caused by the governor's budget, MHCC would have to make severe cuts to programs and services, and raise tuition by about 17.5 percent each year. Some of the programs that would be cut would limit the college's ability to train the future workforce, which was of concern to the gathered professionals who love to hire local talent. "The governor's budget has nothing to do with what we will put out," Monnes Anderson said. "Our budget is the one people should focus on." Representatives from the school stressed the importance of supporting community college. "This cut will ultimately affect our students most of all," said MHCC President Lisa Skari. "By raising tuition, students will suffer. In turn, they'll lose access to affordable education and to opportunities for career development." According to Gorsek, one of the problems MHCC has is access to surplus funds from the state tabbed for education. The money is locked behind a matching fund requirement, which Mt. Hood and other community colleges across the state struggle to generate. In addition to looking to higher education needs, the legislators shared the other bills they will support in the coming session. Monnes Anderson is working on 63 bills, several of which touch on the realm of health care. There is an $800 million shortfall on Medicaid in Oregon, and one solution she sees would be a $2 increase on a sin tax on cigarettes. That amount of taxation would bring Oregon in line with California and Washington. "We spend millions on health care problems caused by smoking," she said. She wants to look into the issue of car theft in East Multnomah County and overturn a ruling that requires proof the person knew a vehicle was stolen for a conviction. "We are going to make sure this goes through, because most of the thefts are being done by the same people," Monnes Anderson said. The senator also will push for bills attempting to find solutions for the housing crisis. One could be allowing nonprofit organizations who want to build affordable housing on their own properties to have access to tax credits from the state. She said she also plans on supporting the Reynolds School District's push for a Student Health Clinic at the high school. Thomsen, the lone Republican on the panel, didn't have as many bills and policies set in stone because he had recently concluded a long — and close — battle for re-election. But he voiced concerns about the lack of conservative voices in Salem. "I'm a Republican, and there aren't many of us left in Salem," he said. "So this could be a tough session." Thomsen said he plans on finding ways to support small business. The other legislators vowed to work with their Republican colleagues to find solutions that work for everyone in Oregon. Bynum specifically voiced a desire to reach across party lines. "I think it's important that the Republicans don't sit out of the session," Bynum said. "We need to hear their perspective."